For awhile, the 99 Percent were able to make up for lower incomes by saving less and borrowing more, and for awhile, the economy indulged them with rising asset prices—first in the stock market, then the housing market—and falling interest rates. But this was not sustainable. Eventually, interest rates hit zero, households spent all their savings, incomes couldn’t keep up with debt payments, and asset prices stopped rising. Hence, the Great Recession. The only real solution is to pay them higher wages. And our government is more likely to invest in public resources that we all need to be productive—infrastructure, research and development, safety and quality standards—if all Americans feel that they’re “in it together” and not separated by class, and thus they’ll all benefit from the investments. Anthony W. Orlando is a Lecturer in the College of Business and Economics at California State University, Los Angeles. This op-ed is an excerpt from his new book Letter to the One Percent, published this month by Lulu Press, Inc. To learn more, visit www. 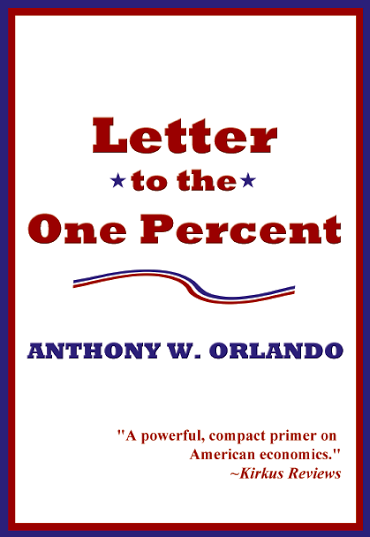 LetterToTheOnePercent. com.